1. Live in the US. Sorry. 2. Be awesome. Easy. Done. Check. 3. In the comments below give me your three rules that all princesses should live by. 1. 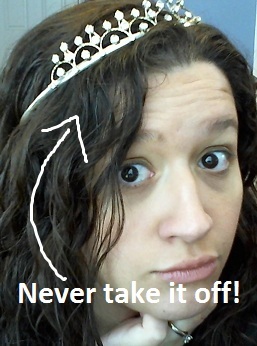 Princesses NEVER take off their tiaras, no matter the occasion. 2. Princesses NEVER turn down chocolate. 3. Princesses ALWAYS take naps. a. The time and duration of said naps are left up to the discretion of the princess. Of course. And there you have it! That's how things would be if I was in charge. Now, it's your turn. If you want to get creative and post pictures or something, just leave a link to your blog in the comments instead. I’ll chose and announce a winner next Monday! And there might be a few runner up type things, because I hate making decisions. So yeah. If you happen to follow me on YouTube or Facebook, stay tuned. ARCs heading that way as well. Wahoo! Happy princessing!